I review a LOT of music, and once in a while an album comes along that I find totally compelling. Usually I can put my finger on what it is that makes me respond to some artists’ music more than others, but sometimes there is simply a mysterious pull that just won’t let go. Waiting’s End, Solo Piano Vol. 1 by KeithTim Anderson is exactly this kind of an album. The music isn’t complicated or showy and it isn’t overly dramatic, but the warmth, hope and sincerity that flow into and out of every note communicate effortlessly and yet so deeply. 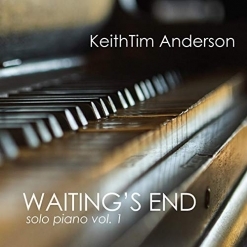 While Waiting’s End is KeithTim Anderson’s solo piano debut, it isn’t his first album. Anderson has been a successful songwriter and vocalist for many years and in a variety of professional settings. As so often happens in life, turning his focus to solo piano came about quite unintentionally. In late 2017, he wrote a couple of piano pieces that he liked, but he still had no plans to do a full album of piano solos. Anderson played the piano throughout his career as an accompaniment to his vocals, had a piano minor in college and is the son of a piano teacher, but all he ever really wanted to do is sing. The irony is that he returned to his hometown in Wisconsin to perform a Thanksgiving concert at his parents’ church, but lost his voice due to laryngitis. Instead of singing as he had planned, he played the two piano solos he had recently composed. They were very well-received, so Anderson continued to compose the eleven pieces on this album. That this album is sub-titled “Vol. 1” gives me great hope that there will be more! I love all eleven tracks on Waiting’s End, but want to mention a few of the pieces. “Autumn Rain,” the first track, is almost magical. The rain here is gentle but slightly percussive and refreshes whatever it touches. “Last Goodbye” is melancholy and bittersweet, but is so graceful and touching. It is the solo piano arrangement of a song co-written with Heather Field. “Long Ago” expresses a heartfelt sense of longing. “Photographs” is a bit lighter and livelier with feelings of nostalgia. The dreamy and wistful “Someday” looks forward to a better day. My very favorite piece on the album is “Somewhere Out There.” This one grabs me every time! Like “Someday,” it expresses a longing for something not yet within reach - kind of like my feeling about wanting the sheet music for this piece!!! Haunting and deeply emotional, I absolutely love it! It’s still very early in 2019, but Waiting’s End, Solo Piano Vol. 1 will definitely be a Favorite Album of the year! I give it my highest recommendation and can’t wait for Volume 2!!! It is available from Amazon and iTunes as well as various streaming sites.